Pourquoi les entreprises ont besoin d'un calendrier de conservation. The federal income tax benefits of donating a properly structured conservation easement are similar to other gifts of land, but were recently enhanced by Congress in 2015 to encourage more landowners to use this effective land protection tool.² The new law allows the landowner to take a deduction for the value of the donated easement up to 50% of the donor's adjusted gross income for the year of the donation. For qualifying farmers or ranchers who receive more than 50% of their gross income from the trade or business of farming, the deduction limit is increased to 100% of adjusted gross income. If the deduction amount exceeds these limits, the donor may carry over the balance of the deduction for up to 15 succeeding years. Berger uses the term "non consuming use" to define activities in the wilderness that do not have a lasting impact on nature. He talks about how these non consuming acts are practiced by the Native People and some recreational activities. He contrasts this with the idea that commercial industry exploits the wilderness in a way that permanently affects it. An interesting example to look at here is commercial hunting and fishing practices in the North compared to recreational and indigenous ones. Commercial hunting and fishing operations does not have a decorated history in the Arctic. Whaling practices have led to the collapse of the North Atlantic Right whale which was at one point considered to be the most abundant species in the Arctic. As of today "it is arguably the most threatened large cetacean in the Atlantic Ocean, if not the world, with an estimated minimum population size of 313 animals." This dramatic decrease in population is not only seen in whales but also in many common fish species in the area as well. 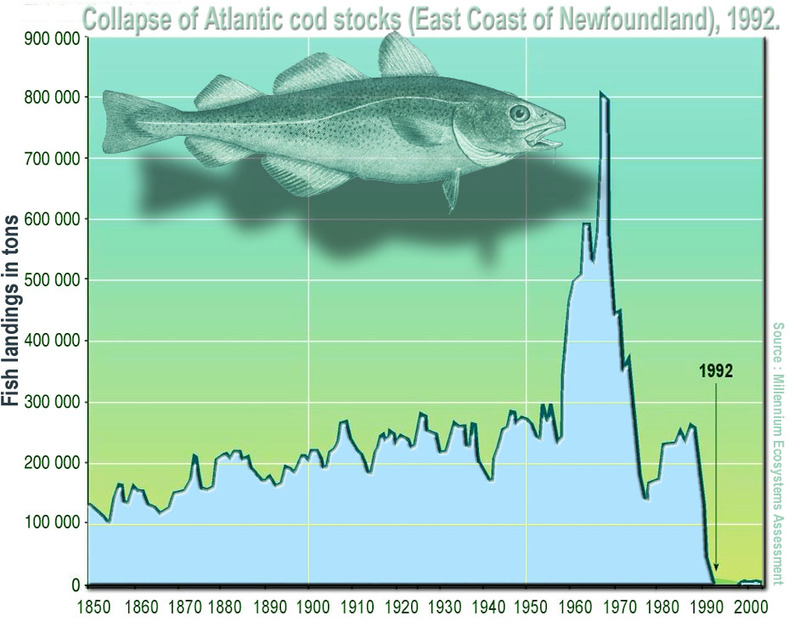 In 1992 there was a moratorium put on cod fishing in Canada because the population was so over harvested that there was only a few schools left in the ocean. Both of these situation brought a lot of economic hard ship to fishing regions in Canada that relied on these populations for work. The irony in this situation comes from how the large scale fishing operations caused a ban for indigenous populations too even for their comparatively miniscule action. Parsons, E.C.M., J. Patrick Rice, and Laleh Sadeghi. "Awareness of whale conservation status and whaling policy in the US--a preliminary study on American Youth." Anthrozoos 23, no. 2 (2010): 119+. Global Reference on the Environment, Energy, and Natural Resources (accessed May 8, 2017). This idea has been an overarching theme in western society for the last half century but the roots of this problem goes back further than that. Since the industrial revolution, Americans have developed the reputation as the most wasteful people and rightfully so. Berger refers to the early days of frontier settlement in North America where there was flagrant misuse of natural resources. It is easy to think of examples of this but one that stands out above the rest was the extermination of the American Buffalo in the Great Plains. Ranchers and hunters were just killing these animals and leaving the corpses out in the fields. Other examples of this is the different mining practices that were used throughout North America. This includes surface mining which is a very intrusive process that leaves the entire area barren and destroyed. In many areas, "because of [surface] mining, the environment has been very bad, and destroyed the balance of the ecology, the stability of the water level and the water quality around the mine for long term." Fortunately, there has been a much stronger movement through sustainable practices within the new generation. Earth Day was created in 1970 to bring awareness to the environment and conservation efforts. In Vancouver, there is a yearly march and celebration led by high school students to help raise awareness of issues facing our planet like climate change and pollution. One student says "without this Earth, without the stuff it provides for us, and if we don't do something about it, it's going to be too late in the future." "Vancouver youth help raise awareness about climate change." Xinhua News Agency, April 27, 2015. Global Reference on the Environment, Energy, and Natural Resources (accessed May 8, 2017). Yi, Pan, Liu Yang, Yang Min, WangLinyan, Yang Shuangchun, and Zhang Jinhui. "The environmental impact assessments of oil shale in in-situ mining and surface mining." International Journal of Applied Environmental Sciences 7, no. 4 (2012): 403+. Global Reference on the Environment, Energy, and Natural Resources (accessed May 8, 2017). Sigurd Olson was a writer in the 20th century who focused on nature and how humans interact with nature. Olson grew up in Minnesota and lived there most of his life where he found his love of nature by traveling to different parts of the state. Olson played a big role in drafting the Wilderness Act of 1964 passed. He was responsible for establishing a few national parks including Voyageurs National Park in northern Minnesota, Alaska's Arctic National Wildlife Refuge, and Point Reyes National Seashore in California. Olson also held the position of President of the Wilderness Society and National Parks Association at different times in his life. With all of the work he did, Olson was a well known figure in the conservationist and environmentalist field. Olson wrote many books about the wilderness of different places he traveled and many of them focused on places in the northern states of the US. 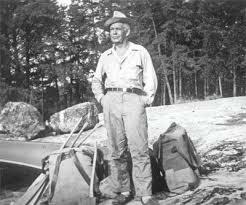 Olson had a simplistic view of nature as he felt "the wilderness offers simplicity and brings people closer to nature. It is also a place where a person can find a renewed sense of identity." Olson's legacy is continued by his preservation work and the many places he was able to establish wilderness protection laws. In 1978 Olson was able to get full wilderness status granted to the Boundary Waters Canoe Area which was the area he grew up near. "Sigurd Olson, a Writer And Environmentalist." The New York Times. January 14, 1982. Accessed May 07, 2017. http://www.nytimes.com/1982/01/15/obituaries/sigurd-olson-a-writer-and-environmentalist.html. Nelson, Michael. "Wilderness." In Encyclopedia of Environmental Ethics and Philosophy, edited by J. Callicott and Robert Frodeman, 402-405. Vol. 2. Detroit: Macmillan Reference USA, 2009. Global Reference on the Environment, Energy, and Natural Resources (accessed May 7, 2017). Wilderness is a very vague term that get used a lot in this chapter. Berger uses the definition which is “A wilderness, in contrast with those areas where man and his own works dominate the landscape, is hereby recognized as an area where the earth and its community of life are untrammeled by man, where man himself is a visitor who does not remain.” This definition covers the technical and legal definition of wilderness, but wilderness has many meanings that has changed over time. Before modern technology, the wilderness was a place that was dangerous and unforgiving. Because of this perception of the wild, there was a sense of masculinity to travelling in the through it. Even today this idea manifests in pop culture as shows such a Man vs Wild are still popular that focus on humans overcoming the elements in the wilderness. However, wilderness has a even deeper meaning than that. There has been a spiritual element to the wilderness that has been integral to North American society for centuries. From the Pilgrims to Thomas Cole to Thoreau to John Muir to Bob Marshall to Aldo Leopold, the spiritual aspect of the wild led these men on philosophical movements. John Nagle argues "the spiritual benefit which people receive from a stay in the wilderness is not a tangible item, but it must be an important consideration in legislation of America is truly dedicated to a somewhat idealistic sense of values." This notion has been seen throughout history as there was a clear sense of spirituality recognized when the Wilderness Act of 1964 was passed. Nagle, John Copeland. "The spiritual values of wilderness." Environmental Law, Fall 2005, p. 955+. Global Reference on the Environment, Energy, and Natural Resources, find.galegroup.com/grnr/infomark.do?&source=gale&idigest=6f8f4a3faafd67e66fa023866730b0a1&prodId=GRNR&userGroupName=bucknell_it&tabID=T002&docId=A141802024&type=retrieve&PDFRange=%5B%5D&contentSet=IAC-Documents&version=1.0. Accessed 6 May 2017. The Sierra Club is a grassroots environmental organization that was founded in 1892 by conservationist John Muir. It has influenced environmental thought and policy in the United States since its creation. The Club was established by Muir after he successfully lobbied for the creation of Yosemite National Park with the intentions of extending Yosemite’s borders as well as promote conservation, preservation, and recreation in California. The success of the Sierra Club since then has been immense, and holds over one million members nationwide. Its involvement with the Arctic National Wildlife Refuge includes recurring lobbying to prevent drilling in addition to creating new wilderness regions. Today, the Sierra Club addresses issues such as climate change, renewable energy, urban spaces, environmental justice, and more. Its presence and influence in Washington, D.C. is critical in providing nature a voice. Lyndgaard, Kyhl. "Sierra Club." In Encyclopedia of Environmental Ethics and Philosophy. Vol. 2. Detroit: Macmillan Reference USA, 2009. Global Reference on the Environment, Energy, and Natural Resources (accessed April 26, 2017). 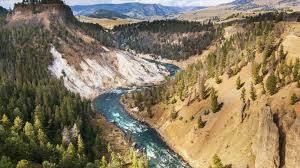 Yellowstone National Park is a large land reserve in the American west that extends into Wyoming, Idaho, and Montana. Yellowstone is very well known for its incredible geology and wildlife. Yellowstone National Park is built on top of a ancient super volcano that causes interesting geological phenomena like geysers and hot springs. Furthermore, Yellowstone has very diverse wildlife that ranges from wolves to American bison to elk populations. Yellowstone was the first ever National Park in the world as it was established in 1872 by President Ulysses S. Grant. The original initiative for national parks came from the idea for people to leave areas of great natural beauty to be left alone and enjoyed by everyone. Though the first national park, the development of Yellowstone stared a theme of conservation and preservation that spread throughout the country. 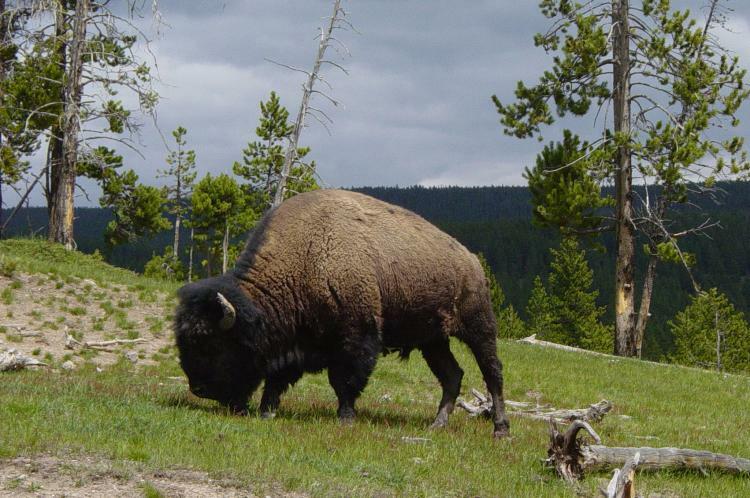 Even to this day, Yellowstone stands as a prime example of environmental preservation because of their ever expanding American Bison population as well as wolf populations. This can be seen even as early as last year as the Obama administration placed a ban on mining in an area near Yellowstone saying, "Today's action helps ensure that Yellowstone's watershed, wildlife and the tourism-based economy of local communities will not be threatened by the impact of mineral development." American buffalo also known as bison were at one point the thought to be the most abundant mammal living in North America. They have been reported to grow up to 6 feet tall and weigh over 2000 pounds. Buffalo, in the wild, are indigenous to the Great Plains region of North America but lived all throughout the continent all the way into Canada and Alaska. This massive animals played an essential role in for many Native American populations throughout history. In the 19th centuries mass hunting of these animals began with the use of horses and rifles. Before this hunting it was reported that one would be able to see entire parries filled with millions of these animals. Over the course of the century, reckless hunting of bison led to a massive collapse of their population. There was many different reasons for their hunting ranging from sport hunting, to killing them to hurt the Native American populations that heavily relied upon them. The American Buffalo has become a symbol of conservation and there has been an ongoing effort to try and rebuild their populations. Recently they were named as the official mammal of the United States as "the bison is North Americas largest land animal the embodiment of American strength, resilience and the nations pioneer spirit.” Many national parks including Yellowstone have protected bison populations that have been steadily growing over the last decades. "American bison designated national mammal of U.S." St Louis Post-Dispatch [MO], November 24, 2016, A17. Global Reference on the Environment, Energy, and Natural Resources (accessed April 10, 2017). http://find.galegroup.com/grnr/infomark.do?&source=gale&idigest=6f8f4a3faafd67e66fa023866730b0a1&prodId=GRNR&userGroupName=bucknell_it&tabID=T004&docId=CJ471488256&type=retrieve&PDFRange=%5B%5D&contentSet=IAC-Documents&version=1.0..
Canada has chosen to pioneer offshore oil and gas exploration in the Arctic. AHRARI, MOHAMMED E. "The Oil Embargo." In OPEC: The Failing Giant, 111-32. University Press of Kentucky, 1986. http://www.jstor.org/stable/j.ctt130j7ns.11. Koch, Wendy. "3 reasons why Shell halted drilling in the Arctic." National Geographic. September 28, 2015. Accessed March 7, 2017. http://news.nationalgeographic.com/energy/2015/09/150928-3-reasons-shell-halted-drilling-in-the-arctic/. "U.S., Canada ban offshore drilling in Arctic waters." CBC News. December 20, 2016. Accessed March 7, 2017. http://www.cbc.ca/news/technology/obama-ban-offshore-drilling-arctic-atlantic-1.3905384. Dr. Ian McTaggart-Cowan was a professor of zoology and Dean of graduate studies at the University of British Columbia (UBC), where he founded and lead the first university-based wildlife conservation department in Canada. Referred to as the "Father of Canadian Ecology,” he was one of the founders of the study of environmental ecology in Canada, and was appointed to the board of The Nature Trust of British Columbia by the Prime Minister of Canada, where he served as director for 33 years. Dr. McTaggart-Cowan graduated from UBC and completed his PhD at the University of California at Berkeley. Since then, he has received many awards and honors for his research and dedication to the research and conservation of wildlife in Canada. His accomplishments also include founding the National Research Council of Canada, serving as Chair of the Environmental Council of Canada, the inaugural and 19-year Chair of the Public Advisory Board of the BC Habitat Conservation Trust Fund Foundation, keystone member (and later Chair) of the Birds of British Columbia author team, chancellor of the University of Victoria, and advocate for whaling commissions in support of its prohibition. At UBC, Dr. McTaggart-Cowan oversaw the research of more than 100 students and continued to inspire generations of academics. During the 1950s and 1960s, he produced television nature programs on CBC (Canada Broadcasting Corporation) such as Fur and Feathers, The Living Seas, and The Web of Life that were aired internationally in hopes of inspiring the youth to advocate for conservation and its research. Dr. McTaggart-Cowan also had a strong political voice and convinced the Canadian government to hire professional wildlife biologists for the country’s wildlife programs. West, All Points. "Canadian Conservation Leader and TV Nature Program Pioneer Profiled in New Biography." CBCnews. October 15, 2015. Accessed March 06, 2017. http://www.cbc.ca/news/canada/british-columbia/ian-mctaggart-cowan-bio-shines-light-on-pioneering-tv-nature-program-host-1.3271571. "Ian McTaggart Cowan." The Nature Trust of British Columbia. Accessed March 06, 2017. http://www.naturetrust.bc.ca/ian-mctaggart-cowan/. Beavers are great for water conservation: they create ponds by damming creeks, and they also dig to make them deeper. We could be collecting the rain water that flows off our roofs (and also elsewhere), but very few people do -- at least not in the US. Elinor Ostrom shared the 2009 Nobel Prize in Economics for her work on governance of the commons -- finite resources shared by a community. She studied such communities, and derived eight principles, which are summarized on this page and on Wikipedia.